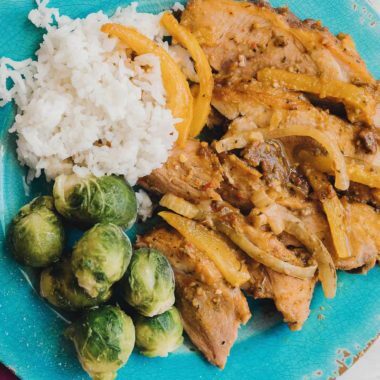 It’s time to dress up in peg legs and eye patches, because this Caribbean Pork Roast will have the whole family shouting “shiver me timbers” when they taste the complex, vibrant, and almost out of this world flavors that meld together perfectly in this dish. Subtle hints of peanut accompanied by delicate spices and a perfectly tender, fall apart roast is why this dish is my families new favorite. I like to serve this dish with some rice and green veggies. Just make sure to pour some of that special sauce at the bottom of the crock pot over the rice. That’s the realllllly good stuff! 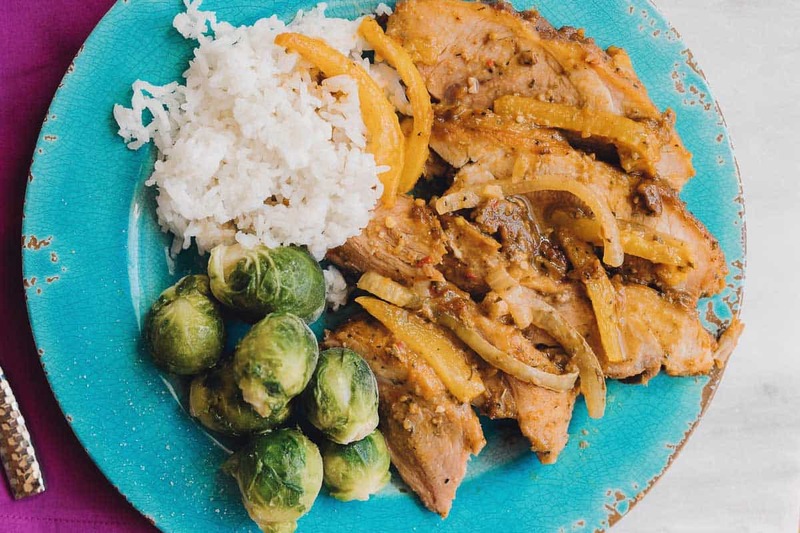 Making this dish into a freezer meal is a breeze. Just dump the trimmed roast, sliced onions, and pepper in a freezer bag. Mix all of the ingredients for the special peanut sauce in a bowl and then place into a smaller ziplock bag. I love how everything can be frozen! The only thing you need to add the day of are some limes and cilantro. It is basically heaven in a freezer bag. 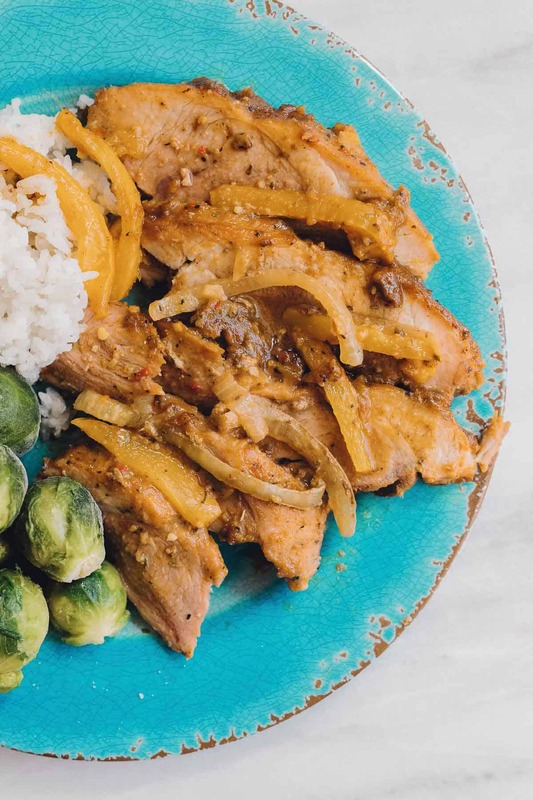 It’s time to dress up in peg legs and eye patches, because this Caribbean Pork Roast will have the whole family shouting “shiver me timbers” when they taste the complex, vibrant, and almost out of this world flavors that meld together perfectly in this dish. Subtle hints of peanut accompanied by delicate spices and a perfectly tender, fall apart roast is why this dish is my families new favorite. 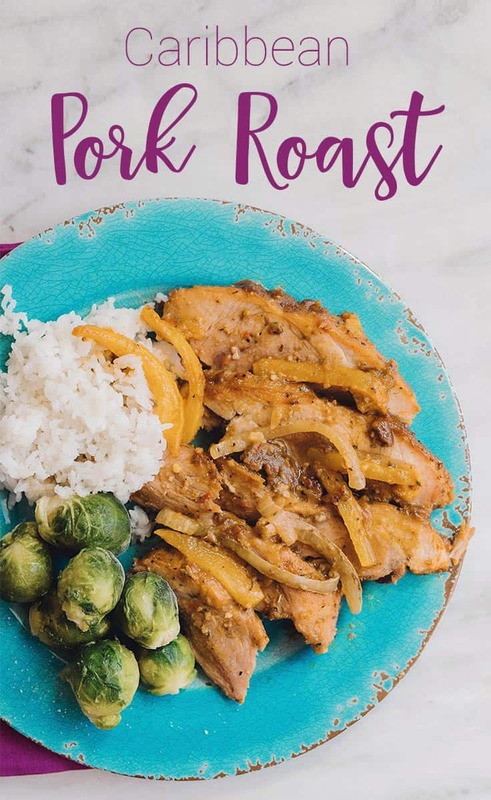 Serve Caribbean Pork Roast with a light slaw, or a curried rice noodle dish for family meal perfection! Trim any excess fat from pork roast. In a medium bowl combine peanut butter, soy sauce, hoisin sauce, grill mate packet, cumin, red pepper flakes, and salt. Slice onion and bell pepper into 1/4 inch (6 mm) thick slices. Place sliced onion in the bottom of a 5 Quart (4.73 L) slow cooker. Place Roast on top of onions. Pour sauce over the roast, then place the sliced bell peppers on top. Cover and cook on low for 6-8 hours, or on high 3-4 hours. Remove from slow cooker, cut into large chunks, top with some of the juices it cooked in, lime juice, and minced cilantro. Place trimmed roast, sliced onion, and sliced bell pepper in a labeled gallon (4 L) freezer bag, remove as much air as possible, seal well. 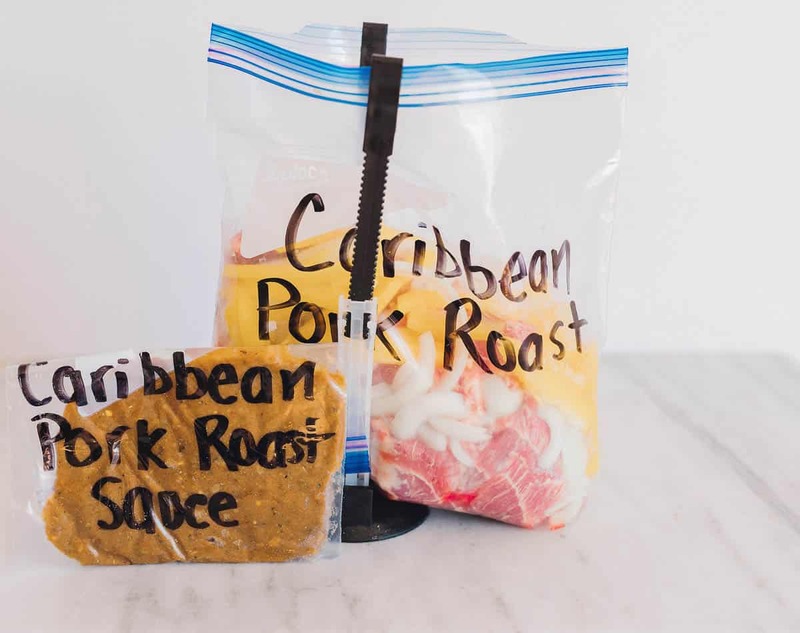 Pour sauce into a labeled quart (1 L) freezer bag, remove as much air as possible, seal well. Freeze next to the pork roast. Place Frozen contents in bags in a large bowl in the freezer to thaw 24 hours prior to cooking. Once thawed, place onions in the bottom of a 5 Quart (4.73 L) slow cooker. Put roast on top of onions, pour sauce over the roast, and top with bell pepper slices. Cover and cook on low for 6-8 hours, or on high 3-4 hours. Remove from slow cooker, cut into large chunks, top with some of the juices it cooked in, lime juice, and minced cilantro. Your pictures look like there is a broth with the pork…but there is no mention in the ingredients. Is there supposed to be any liquid frozen with the pork? Thanks Karrie for another awesome recipe!! !